Throughout the past 100 years of Paly history, The Campanile has been documenting life on campus and beyond. From covering complex issues arising in our town to providing light-hearted, entertaining satires, we have written an abundance of important articles that have impacted a wide audience. This edition of the Centennial Report delves into the similarities and differences between student life in the 1900s and early 2000s versus present day. Ninety-two years ago, Paly administrators explored ways to get more students involved in extracurricular activities. The school created a committee to implement a system in which students received points for participating in various activities. The points could ultimately earn students a reward, such as a seal on the student’s diploma. The administrators formed two sub-committees: one to manage the distribution of points and another to choose an award. A questionnaire that asked students how many activities they participated in determined the minimum number of points needed to earn an award. Today, it seems no such point system is needed to encourage the abundance of ambitious students at Paly to flood their schedules with extracurricular activities. The Campanile published a short notice to help out a fellow publication, Madrono. The yearbook staff was having trouble getting enough orders for the yearbooks — they had only sold 100 tickets, and needed to sell 550 in order to print the yearbooks. In contrast, the modern-day Madrono sells about 1,500 yearbooks each year. Another difference between the yearbooks in 1935 and the Paly yearbooks now are the price — in 1935, one yearbook cost $1.50 (in today’s money, this is equivalent to $26.80). Today, Madronos are sold for a starting price of $75, which is raised to $90 in January. 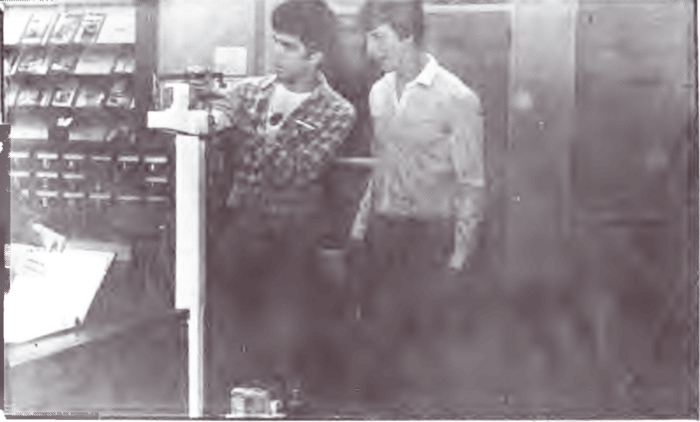 In 1983, Paly held a four-day food drive to collect food and donations to help families in need. The food drive ultimately collected around 10,000 dry and canned food items and about $2,000 in donations. A friendly competition between classes incentivised the food and donations — the winning class received a free brunch. Mrs. Small’s class, which brought in 1,965 pounds of food, ultimately claimed victory. Today, a very similar food drive is done, with advisory classes competing for food incentives such as donuts and pizza. In 2003, Paly boys basketball won first place in the Cougar Classic tournament. Current Brooklyn Nets player Jeremy Lin, a sophomore at the time, showcased great game play in the tournament and was ultimately named Most Valuable Player of the Cougar Classic. In addition to being mentioned in the article about Cougar Classic, Lin was featured in a short “Athletes of the Edition” section of this paper alongside Katherine Stolpa, a senior girls soccer player at the time. Visit palyjournalismarchive.pausd.org to find more of The Campanile’s past articles. Ninety-two years ago, Paly administrators explored ways to get more students involved in extracurricular activities. The school created a committee to implement a system in which students received points for participating in various activities. The points could ultimately earn students a reward, such as a seal on the student’s diploma. The administrators formed wo sub-committees: one to manage the distribution of points and another to choose an award. A questionnaire that asked students how many activities they participated in determined the minimum number of points needed to earn an award. Today, it seems no such point system is needed to encourage the abundance of ambitious students at Paly to flood their schedules with extracurricular activities. The Campanile published a short notice to help out a fellow publication, Madrono. The yearbook staff was having trouble getting enough orders for the yearbooks — they had only sold 100 tickets, and needed 550 in order to print the yearbooks. In contrast, the modern-day Madrono sells about 1500 yearbooks each year. Another difference between the yearbooks in 1935 and those of today are the price — in 1935, one yearbook cost $1.50 (in today’s money, this is equivalent to $26.80). Today, Madronos are sold for a starting price of $75, which is raised to $90 in January. In 1983, Paly held a four-day food drive to collect food and donations to help families in need. The food drive ultimately collected around 10,000 dry and canned food items and about $2,000 in donations. A friendly competition between class incentivised the food and donations — the winning class received a free brunch. Mrs. Small’s class, which brought in 1,965 pounds of food, ultimately claimed victory. Today, a similar food drive is done, with advisory classes competing for prizes such as donuts and pizza. In 2003, Paly boys basketball won first place in the Cougar Classic tournament. Current Brooklyn Net Jeremy Lin, a sophomore at the time, showcased great game play in the tournament and was ultimately named Most Valuable Player of the Cougar Classic.